Gunmen robbed a popular Southport Corridor restaurant after closing time on Sunday night, police said. No serious injuries were reported. Around 12:15 a.m. on Monday, three masked gunmen entered Tuco and Blondie, 3358 North Southport Avenue, and held the restaurant’s staff at gunpoint, police said. The gunmen proceeded to rob the restaurant and the employees, emptying the safe, a cash box, and taking five cellphones, according to police. The robbers then fled out the back door. Police believe the crew then got into a vehicle and drove out of the area. All of the victims refused medical attention. Police said the offenders were three black men who wore dark hoodies. 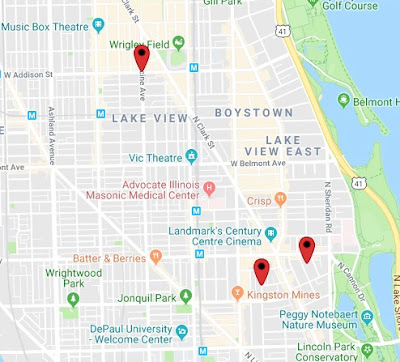 The incident was the second take-over robbery of Lakeview businesses this week. On Thursday, a gunman entered the Walgreens at 1001 West Belmont Avenue and forced employees into a back office where he emptied the safe and robbed the workers. In addition to the restaurant robbery, two muggings have been reported in Lakeview and nearby Lincoln Park since Sunday evening. Approximate locations of the recent muggings. Around 2 o’clock this morning, a man was robbed at gunpoint near Wrigleyville, police said. The victim was in the 1100 block of West Addison when the offender approached him and demanded his valuables. After getting the man’s property, the robber got into a white four-door vehicle that was last seen heading westbound on Waveland. The gunman was a black male who wore a navy hoodie and blue jeans, according to the victim. Around 9:45 p.m.last night a woman was beaten and robbed by three men in the 600 block of West Drummond Place. The victim reported that the men got out of a black Chevy Impala with dark tinted windows and attacked her near the intersection of Drummond and Orchard, then fled northbound on Orchard on foot. She said the robbers were three black men dressed in dark clothing.